For the 2016-2017 biathlon season, Rapid Insight will proudly be sponsoring Mount Washington Valley local Olympian, Sean Doherty. 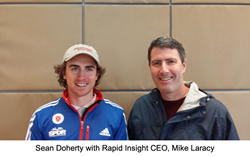 As I start my training for the upcoming season, I am really excited to have Rapid Insight onboard as a sponsor. Olympic athlete and Center Conway native, Sean Doherty, has already forged an impressive path in the biathlon world at the young age of 20. In 2015, Doherty became the most decorated Junior Biathlete of all time when he won his 9th and 10th medals at the World Junior Biathlon Championships in Cheile Gradistei, Romania. The young athlete found his interest in the sport at the age of 12 and quickly forged a name for himself. Doherty grew up skiing the trails of New Hampshire and in 2013 he became the first biathlete in history to win three medals at the Junior World Championships. Doherty competed in his first World Cup and then proceeded to join the circuit as part of the US Men’s squad during the 2013-2014 season. In 2014 he became the youngest biathlete to compete in the Winter Olympic Games in Sochi, Russia. Today he continues to race on the World Cup circuit as part of the US Men’s Biathlon Team, building on his already impressive career at 20 years old. “As I start my training for the upcoming season, I am really excited to have Rapid Insight onboard as a sponsor. I always appreciate how much support I get from the Mount Washington Valley,” stated Doherty when asked about his new sponsor. “Everyone who works at Rapid Insight is very involved in our local community. Sean is an inspiration to so many people here in the Mount Washington Valley and we saw our sponsorship as a great extension of our community involvement,” shared Mike Laracy, CEO at Rapid Insight. During Doherty’s 2016-2017 season Rapid Insight will be posting updates on news and results on our website http://www.rapidinsightinc.com. You can also visit http://www.usbiathlon.org to learn more about the U.S. Biathlon Team. Rapid Insight Inc. is a leading provider of predictive analytics software and solutions that provides organizations with the ability to make data-driven decisions. Focusing on speed, efficiency, and usability, Rapid Insight products enable users of any skill level to quickly turn their raw data into actionable information. The company’s analytic software platform simplifies the extraction, analysis, reporting, and modeling of data for clients ranging from small businesses to Fortune 500 companies. For more information, visit: http://www.rapidinsightinc.com.